He is arguably, the most famous Jazzman that ever lived. Equally, arguably, he is also the most influential. Mention the name Louis Armstrong and several things come to mind: the smile, the voice, the music, his appearances in films and so much more. Not often mentioned, or hardly ever, are his various tours to Africa. One of these tours, in 1960/61, started in triumph but was to encounter tragedy in Sierra Leone. 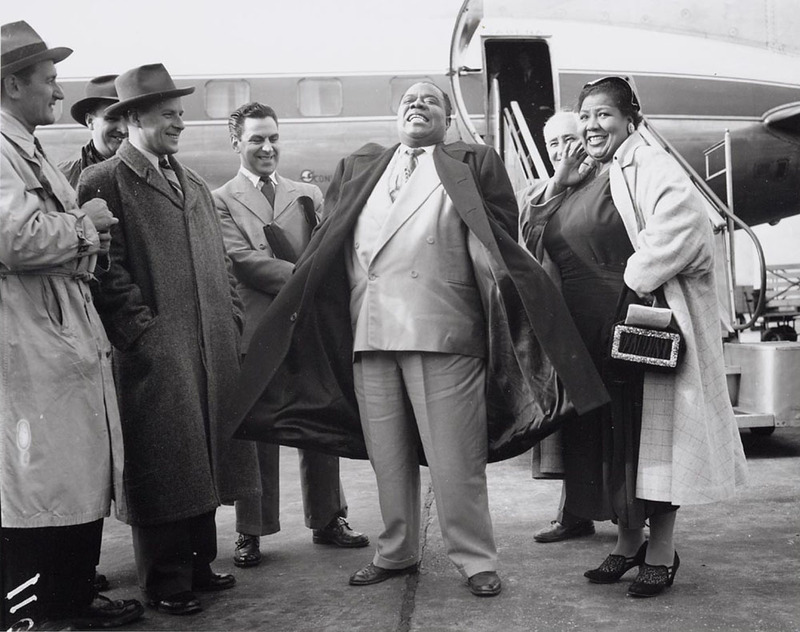 Armstrong and his musicians had, for many years been among America’s best ambassadors; spreading ‘cultural diplomacy’ often in places where ‘traditional diplomacy’ had failed or could not reach. 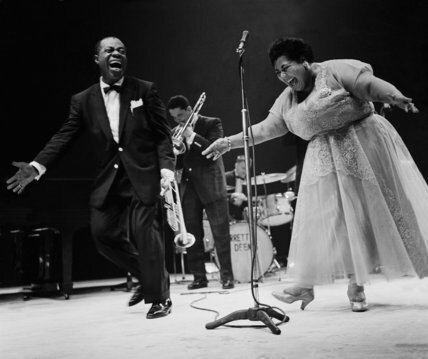 Soon after the end of World War 2, Armstrong and his Allstars toured western Europe and Scandinavia in 1949 and there are many images of the rapturous reception he and his musicians received, particularly in Paris and Oslo, on that tour. For the man himself, he always said his tours to Africa were an awakening in so many ways. Firstly, he was able to see, first-hand, how unbelievably popular he was across the African continent; a fact that left him truly stunned and determined to return after his first visit in May 1956. The ‘official and conservative’ estimates have it that on the tours of Africa, Armstrong and his banned played to about 500,000 (half a million) people. Most of the concerts taking place in sports grounds or stadia. In Ghana, he played to an estimated 100,000 at the Old Polo Grounds. They also found time to play more intimate concert venues and see and hang out with local musicians. It wasn’t all work, of course. In their ‘down time’, Armstrong got to see and hear two of Africa’s greatest: Ghana’s E.T. Mensah (on the first trip), at Mensah’s Paramount Night Club, where after dinner, he could not resist the urge to get on stage and join the band and Congo’s Kabasele (on the second trip). The other crucial awakening was when Armstrong told a reporter that, on his first trip to Ghana (the Gold Coast, as it was then), on seeing a woman who reminded him of an aunt, he realised “yes, this is where I am from”. On that 1956 trip, Armstrong not only met his adoring public, he got to ‘hang out’ with the man who would become the soon-to-be-independent country’s first Prime Minister, Kwame Nkrumah and his wife. 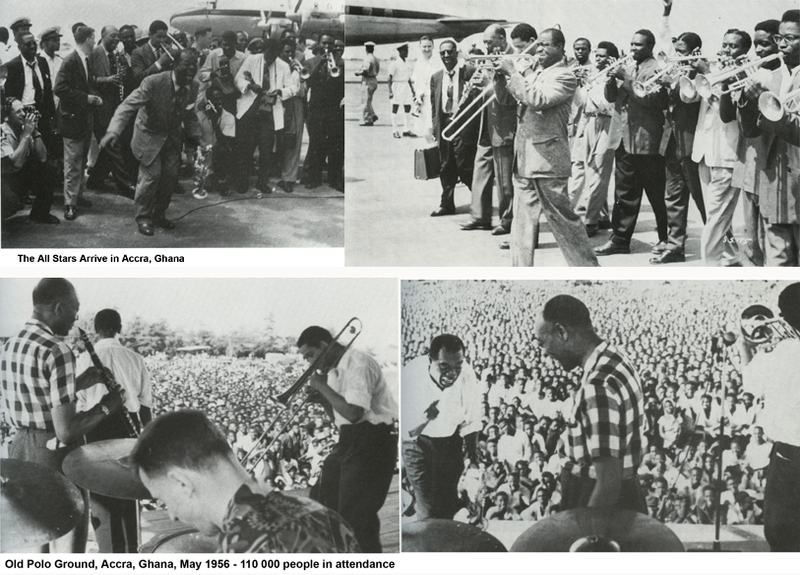 By all accounts, Nkrumah attended both of Armstrong’s concerts on what was a two-day tour. 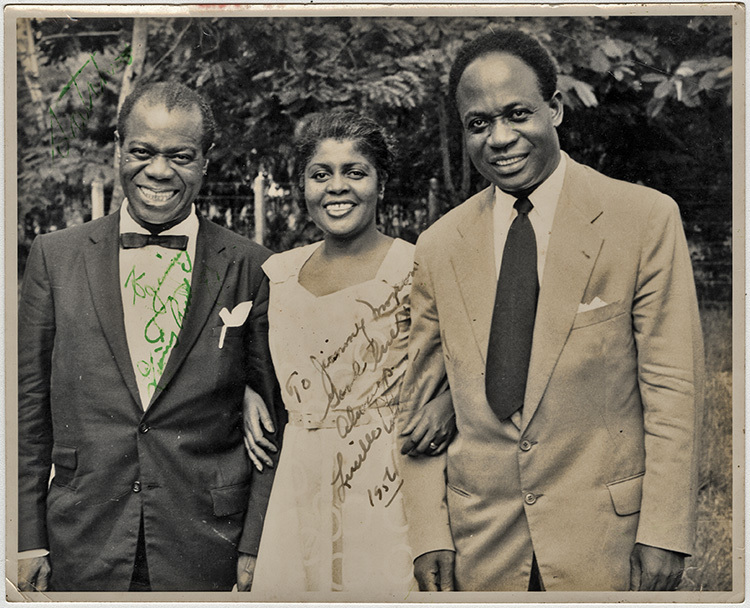 Nkrumah, was said to have developed his love for Jazz while studying in America in the 1930s. Unlike later tours that were encouraged and part-sponsored by the US State Department, the 1956 trip was sponsored by a record company, CBS. In fact, it has been posited that the success of that trip was a defining factor in the State Department thereafter using Armstrong as their most famous ‘cultural ambassador’. What is often referred to as his ‘Second African tour’ and featuring his All-Stars Band started in October 1960 in the Congo Republic and proceeded to Ghana, Nigeria and Kenya and Uganda and, into 1961, took in Sierra Leone and Guinea. Everywhere they went, the reaction was the same: pure adulation. Remarkably, consideration had been given including South Africa on that itinerary. However, with that country’s then-apartheid system, it always seemed a non-starter. Armstrong had a multiracial group and, with his experiences in America, had by this time made it clear he would never play to segregated audiences. However, film has emerged of Armstrong and his party landing in Bulawayo, in Rhodesia (now Zimbabwe), a country that operated a similar apartheid-style racial policy as South Africa. And, the film also shows Armstrong, Middleton and the band, playing to multiracial audiences. On arrival in Sierra Leone a few months before the country gained independence, he received and accepted an invitation to dinner on January 15, 1961 from Governor Maurice Henry Dorman. Velma Middleton had been a member of Armstrong’s ‘extended musical family’ and had accompanied him on his European tours of the 1940s. She was known to be a fine singer. However, in keeping with several comedic elements of a typical Armstrong performance, she too, had her party piece and one that would inevitably bring gasps of admiration from the crowds. Middleton was a lady of considerable girth, weighing in at 20-plus stones. After singing a few songs, she would execute dance moves one would not expect someone of that size. Just as the audience was getting used to that sight, she would execute the splits in a manner that would have done a gymnast proud. At this point audiences would exchange incredulous glances and applaud furiously. In Sierra Leone, at a concert at the British Council, On January 25, Middleton was not performing her signature dance moves; she was singing, grabbed her chest – having suffered a heart attack – and fell to the stage in front of a shocked audience. She was rushed to Hill Station Hospital and plans were made to fly her home once she got better. However, it was not to be, and she died on February 10, 1961. Having been with the group for so long and with them being such a tight-knit group, Velma Middleton’s death was a hard one for the group to take. However, as is usually the way of these things, they were persuaded to carry on as ‘that is what she would have wanted’. In addition to Louis Armstrong, the rest of the ‘family’ was made up of Mrs Lucille Armstrong, Barney Bigard (clarinet), Mort Herbert (bass), William ‘Billy’ Kyle (piano), Trummy Young on trombone and Danny Barcelona on drums. The tour left several lasting legacies, chief among them, the number of musicians across the continent who took up playing the trumpet, as that was King Louis’ instrument. Ten years after that Sierra Leone trip, Louis Armstrong would be dead.